Amon Amarth vs Grand Magus: who are the ultimate Vikings? 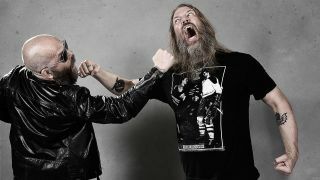 As Amon Amarth and Grand Magus set sail for the UK, we pit their frontmen against each other in the ultimate Viking test. But who will have Odin on their side? What would your Viking name be? The Vikings raided towns and monasteries, but what would you most like to pillage? What would you eat and drink at your ideal victory feast? Can you tell us how to construct a Longship? Vikings had to die in battle to be worthy of Valhalla… Why would you be worthy? Could you perform a blood eagle execution? What’s the most obscure Viking fact that you know? Who’s your favourite character in the TV show Vikings?